The organisation of the meanwhile 121 th Winner Show, being hold in the congress-building R.A.I. in Amsterdam, have asked us to give demonstrations. The Winner Show is the oldest and largest dog show of the Netherlands. Participants from more than 35 countries and 283 dog breeds!! We have given demonstrations para-agility and servicedogs, both days in the ring of honor and the ring in front. Always very nice to work on such a big show, with a large public! Joep took care of the demonstrations servicedog, with some little extra help of Joy (my youngest dog, just 6 months old) who have showed to apport a keychain. 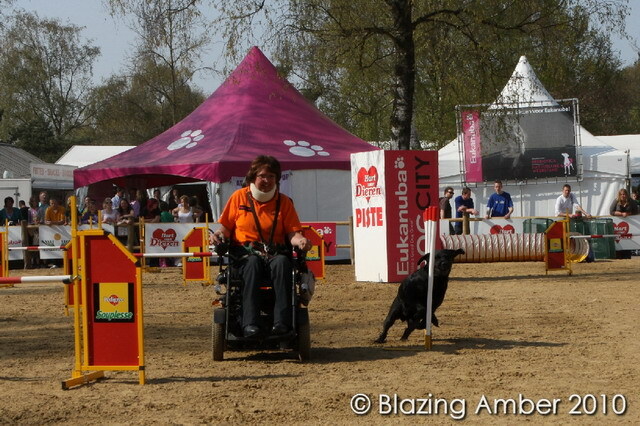 The demonstrations para-agility was attended by Quita, Joep and Joy. As last part we have connected two tunnels and one flat-tunnel. 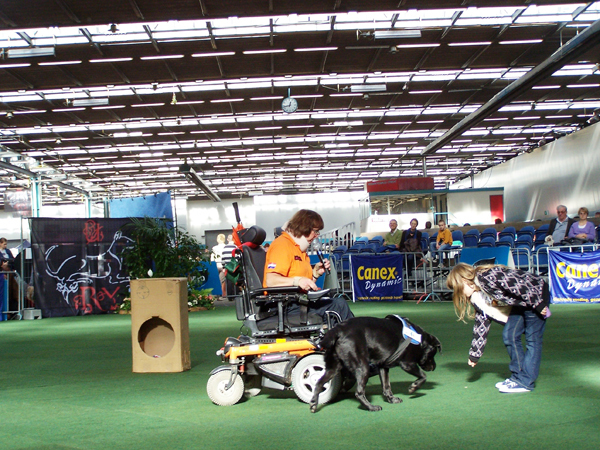 They have asked us to give demonstrations para-agility and servicedogs on the Hobby & Leisure Show in the WTC-Expo Hal in Leeuwarden on saterday and sunday. A sister of Joy, Fayth lives in Leeuwarden and she and her owners game to the stand of Servicedogs to give enthousiast help. 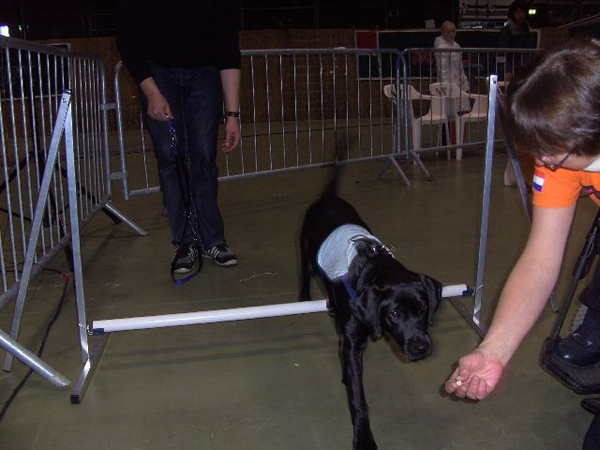 Fayth became her first agility workshop and give later, together with Joy, a demonstration para-agility which was very beloved by the public! 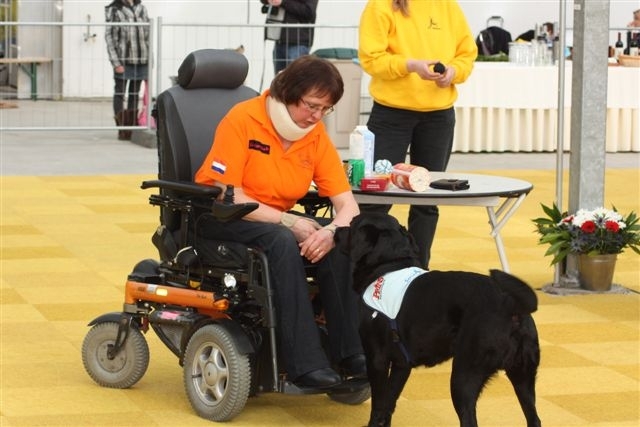 Marije van Ingen have asked me to give assistance to her lecture about servicedogs on the primary school De Vuurvogel , located in the school complex De Laak, in the residential Vathorst in Amersfoort. Marije have given enthousiast explanation about the education and work of servicedogs and Joep could demonstrate some of this work. The peers have listen very attentively and have every kind of questions after our demonstration. Also this year the organisation of the Show in Utrecht have asked us to give demonstrations servicedogs and para-agility together the group agility handlers of the dogshool URV conducted by Wil Lutters. Melissa gives help to throw a little coin on the ground, which Joep will pick up later! 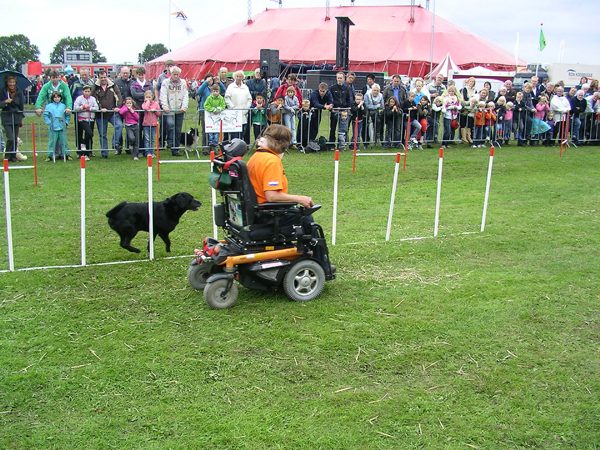 Once again the organisation of the IJsselshow have asked us to give demonstrations servicedog and para-agility. On this show always a very interesting programm with all kind of demonstrations the hole day. Because it was the jubilee of ten years, they had a special demonstration of predatory birds by Jannie and Gerrit Zandvoort van Valkerij Rijssen (www.valkerijrijssen.nl). 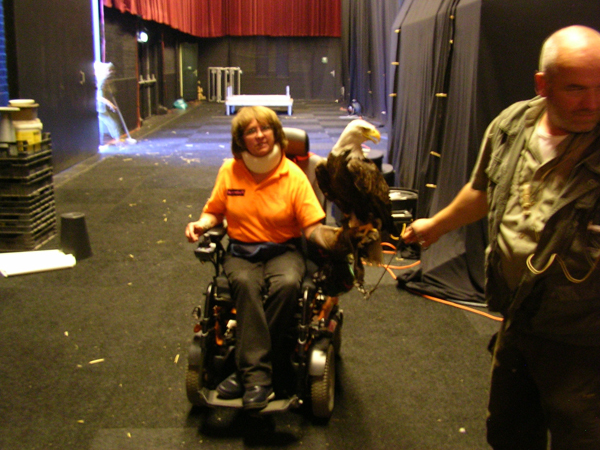 They have asked me to fly into my arm Harly, a white-tailed eagle. For the first time very exciting, but also very impressive! Also Joy have given a demonstration into the tunnel and flat-tunnel! From 16 untill 19 September was organised for the 19th time the Dorpsfeest Hoogland, in the big town-park " Schothorst" in Amersfoort. A big Horse-Event, but also a lot of information/ demonstrations all sorts of sunjects. We have given demonstraties para-agility and servicedogs and after this there was the possibility for visitors with their dog to practical agility, they make use of greedy! For my young dog Joy, she was just 4 months old, it was her first demonstration para-agility. She have taken spontaneous the tube and the flat-tube, for the visitors very nice to see how such a young dog works with a lot of fun! Quita running an agility-course with a lot of fun! 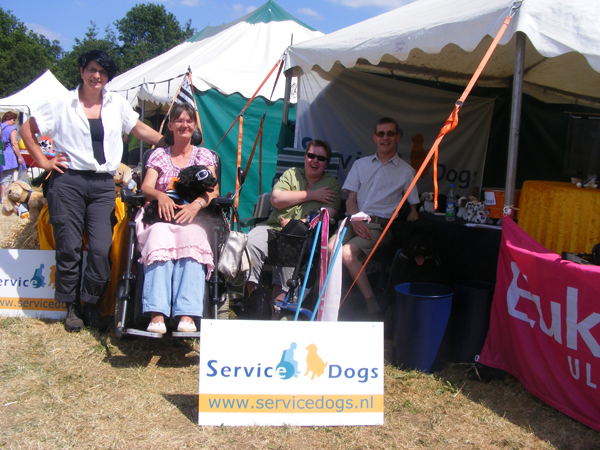 St. Servicedogs ( www.servicedogs.nl ) on the event Country-Fair in Aalten. A very big event of horse-sports but even a lot of attention for dogsports! Also a lot of information- and salestands with all kinds of themes. 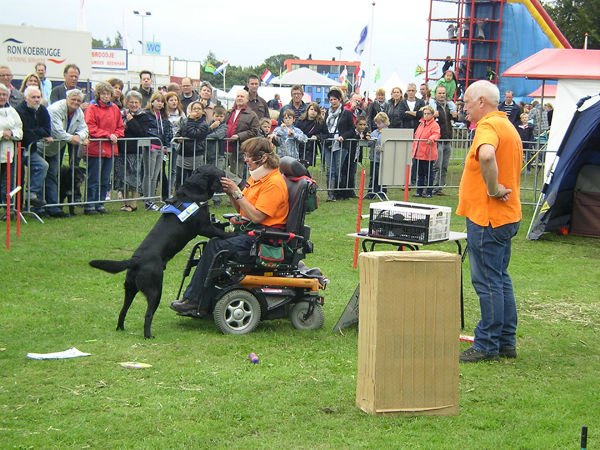 Joep had given all three days demonstrations as a assistancedog and together Quita demonstrations para-agility, looked with a lot of interest from the visitors. The organisation of a big 4- days International Event of Horse-Sports have invited us to give demonstration service-dog and also para-agility. A good organised Event and because the weather was sunny it is was very succesfull for the big number of visitors! Also demonstrations treibbal (football for dogs) and pushball by Hélène de Fremery (www.pushball.nl), a football with horses, very impressive, sure with the big ball. Even demonstratiosn with Quads, who at the end of the demo pushball came back into the ring and play football together the horses....great to see that this was possible! Together a trainster of St. Personal Servicedogs, Tina Prins, I went to the child-farm " De Maten" in Apeldoorn. We go to give demonstration servicedog and also para-agility to a special group, named " ECO-group" (children on the age of 8 untill 12 years) who come together every wednesday to study someting about the scenery and animals, by accompaniment of Marieke Konings. Very enthousiast they lissen to our explain how to associate with dogs, and how dogs can give help in many different ways! 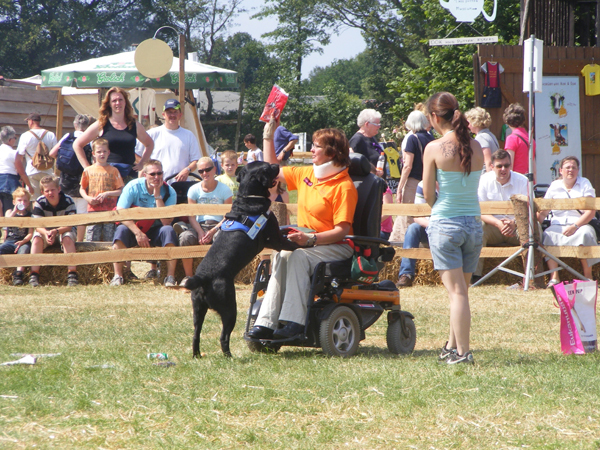 A big Event about dog- and horsesports and also attention for other little domestic animals. A lot of well-known people had given demonstration like: Ellen & Serge van de Zweep and Mike van de Most, who had given demonstration drift with their Border Collies on sheeps, gooses and ducks. Also Birgitte van Gestel who can show how to work with your dogs on doggy-dance, by a very special way! Katja Slippens had given a very nice demonstration agility on high level! We had given demonstration para-agility and also servicedogs. A great experience to do on such a big Event! The weather was very good, so a lot of visitors......about 27.000 ! By dogshool Rijnland werd op 20 and 21 March organised an International Dogshow on the Hal Plantarium in Hazerswoude. They had also given demonstration obedience and agility.They had asked me to give demonstration serviocedogs with my young dog Joep and para-agility with both dogs Quita and Joep. For us the second time, so good to meet again a lot of friends practice dogsports! By the Noorder Kynologen Club was organised on 6 & 7 March 2010 the 50th MartiniDogShow on the Martiniplaza Hal, Groningen. An International Dogshow with about 2500 participating dogs from a lot of different countries. They had invited us to give demonstration para-agility and servicedogs. Everytime very nice to see how my young dog Joep first give demonstration as servicedog and successively very enthousiast runs his agility-course! (www.discoverfrisbee.nl), doggy-dance by the group "close to dogs" (www.closetodogs.nl) and rally-o, a new obedience-sport (www.rally-o.nl). A very sociable weekend, good organised and co-operation! On thursday 4 Februari we drove very early direction Alphen aan de Rijn to give demonstrations service-dog and para-agility. 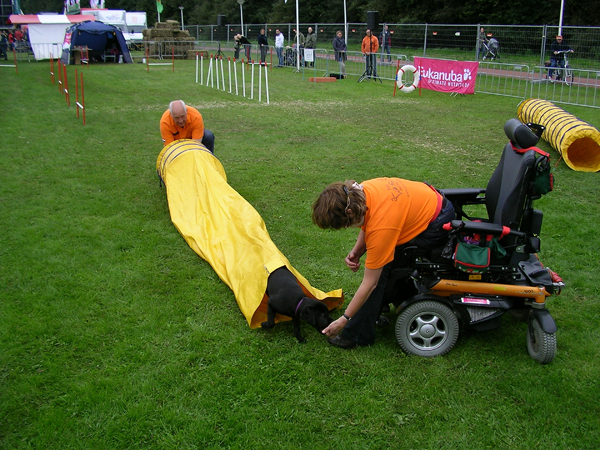 Demonstration servicedog with Joep and para-agility with both, Quita and Joep. We were quest on basicschool " The Weerklank" a special school for children with bad hearing and speech-problems (www.deweerklank.nl). 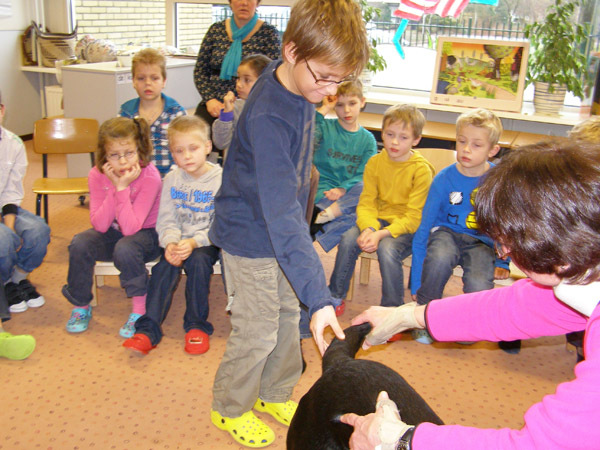 The demonstration servicedog was being held for group 4 of the school. 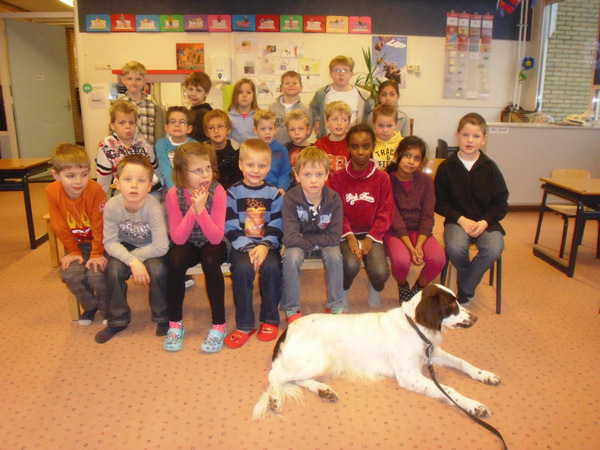 At this moment they were working on a project about dogs and in the class-room they have make a real dog-museum. At the end of the demonstration there was opportunity for the children to ask questions and they had a lot of nice and clear one. They have prepared very good! Even they want to measure the tail of Joep and want to feel the thickness ! Just before the lunch we go out and on a little grass-field we have build a little course. We were lucky about the weather, it was not raining! The ground was muddy after a vew weeks of snow, but I could drive and show some para-agility. The flat-tunnel at the end of the course is always succesfull, the children like it very much when the dogs came out this tunnel very fast! All groups came out to see this demonstration and for closing they could stroke the dogs and give them some hugs if they like! Everytime it's very good to see if some children who are very affraid of a dog, stroke them at the end! I have recieved a very nice little book with pictures maked by the children of group 4 and a photo of the group! Thanks again! !